WARNING: THERE MAY BE SMALL SPOILERS IF YOU HAVEN’T WATCHED YET. The book series is billed as a mystery, and the show certainly has a mystery element, but it is really about the town and the inhabitants and their struggle to survive in a world that is far from accepting of them. The first show starts with the main character, Manfred Bernardo, a psychic, on the run from someone named Hightower and looking for a place to hide. His dead grandmother suggests Midnight, Texas. Yeah, Manfred sees dead people. This ability plays big in the first episode and for the record he sees people as they died. So, if you are a believer in Harris’ mythology here, plan to die pretty. The people Manfred sees have missing parts and bloated parts and foul-looking water bubbling out of their mouths. In addition to a psychic, Midnight boasts a vampire, a bounty-hunter, a witch, an angel or two, and at least one shapeshifter. I won’t go into anymore detail than that as roles are defined and revealed as the shows go on. For the most part, the kids (15 year old boy and 18 year old girl) and I are enjoying the show. We are all big paranormal fans of one type…not always the same type, but Midnight hits the intersection of our Venn Diagrams enough, and it is nice to have something we can watch together. There are definitely some hokey parts and none of us are a fan of the vampire. We also have issues with the shapeshifter who was revealed in the second episode. Let’s just say the animal he shifts into isn’t what any of us would pick for a middle-aged white guy who dresses like some old West villain. Or maybe to be more accurate, for the animal he shifts into, we would have liked to have seen a bit of ethnic diversity… But the witch is pretty good and the idea of the town fun. Overall, we are liking it and will continue to watch. How about you? Both my husband and I have been watching this series. I love it since I’m into supernatural/paranormal romance books. We are in the older group (70’s) but I love any show like this. It’s the only new summer show I watch. I’ve read all the books, but the shows are still great. I’m really enjoying it. I’m read a lot of paranormal so this is right up my alley. I haven’t read the books, so I’m curious; is this show anything at all like Ms. Harris’ work? Or is she yet another victim of horrid TV-adaptation along with Kelley Armstrong and Stephen King? I’m enjoying it because I’m a fan of PNR and supernatural anything on TV. It is a bit tame for my liking, but it is NBC after all, even if it airs at 10pm. The special effects are good. You don’t like the gladiator trainer from Spartacus (the regular&psychic vampire Lem)? Is it the actor himself that you don’t care for or his character in general? How is he in the books? I think that too much happens in each episode without sufficient backstory or information given. That may be just because I haven’t read the books, but it seems like there could be alot more development. I’m recording the series on my DVR (as I do everything I watch these days, because I can’t tolerate commercials, and my schedule doesn’t allow for me to sit and watch at specific times and days) so I’m behind; just watched episode 5, where Hightower shows up in Midnight. That was probably the worst episode yet, IMO. Bizarre, and everything got resolved too neatly at the end, as is the case with this show it seems. I do like seeing Lexi from the Vampire Diaries (Olivia), Cesare from The Borgais (Manfred) and other faces I recognize but can’t place. But who names their daughter Fiji? Or Creek? Or their son Bobo? Odd character names, IMO. So, are the books better than the TV show (beyond the basic, “well duh-absolutely”)? Are they smexier? More PNR or UF? (I like both genres but prefer more smexy times recently, lol). 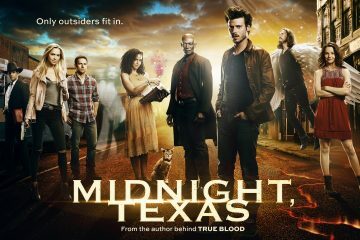 How many are Midnight,Texas books are there? With the episodes going back and forth between characters, I’m wondering if all are featured in every book, or is each highlighted in “their own book”? That is always a great sign when people who have read the books like the show. There have been some big disappointments in that area… did you watch Bitten? I was SO upset by that show. I’m looking forward to next season and I love having summer series! Fall is here now and we have Lucifer… do you watch that?